Home at Bailey Corner straddling the border between Pilesgrove Township and Woodstown Borough. It’s not an everyday occurrence for two municipalities in New Jersey to work together to build affordable housing, but that is what happened at Bailey Corner. What started in 2002 as a plan to meet one town’s affordable-housing requirements—and took seven years from conception to groundbreaking—has turned into a model for inter-municipal cooperation. Situated on nine acres straddling the border between Pilesgrove and Woodstown, Bailey Corner was originally conceived as 75 affordable units, part of a larger redevelopment master plan for Pilesgrove and an attempt to satisfy the township’s outstanding affordable-housing obligation. But the two municipalities agreed to expand the project into Woodstown, allowing another 16 units to be built that satisfied Woodstown’s affordable-housing obligation and giving the project access to Woodstown’s sewer system. Both towns satisfied their affordable-housing obligations and have shown that the result when jurisdictions work together can be greater than the sum of their individual efforts. In agreeing to do this, both municipalities insisted that the development connect with and enhance the character of its surroundings—the older, compact Woodstown neighborhood on one side and newer commercial development in Pilesgrove on the other. It needed to draw the pedestrian-friendly nature of the Woodstown neighborhood into the new development and, at the same time, accommodate effectively the volume of both residents and vehicles that 91 additional units would bring. 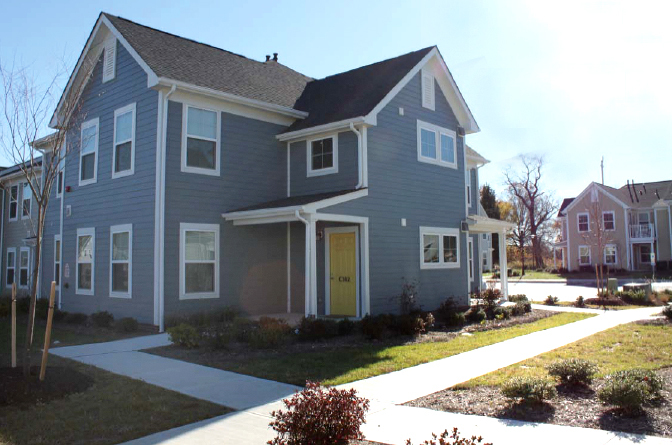 Cherry Hill-based affordable-housing developer Ingerman and Haddonfield architectural firm Haley-Donovan addressed these priorities by designing the units into two-story buildings of Colonial style and scale. The development, right down to its name, Bailey Corner, has a small-town feel to it, with each of its apartment buildings linked by sidewalks on narrow streets within the community. The main road and sidewalks from the new community link through to the older one and also provide safe access to the newer, highway-oriented amenities. 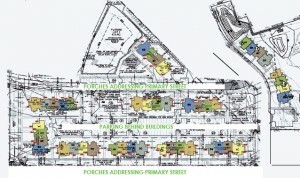 Site plan at Bailey Corner located in Pilesgrove Township and Woodstown Borough in New Jersey. Parking was moved off the street and into a long, wide alley behind the buildings to avoid vehicular congestion and enhance pedestrian safety on the main roads. A Colonial-style community building, a community garden and a small pocket park with a tot lot were placed in the middle of the neighborhood, forming a town square-like nexus for community congregation. Compatible streetscaping, lighting, signage, additional sidewalks within the community, indigenous drought-resistant landscaping and related environmental design components complete the integrated neighborhood feel. The residences are available in a range of sizes: 14 one-bedroom units, 49 two-bedroom units and 28 three-bedroom units, all single-story and designed in six different styles. Each has a separate entrance and a covered porch facing the street, and the ground-floor flats are wheelchair-accessible and fully handicap-adaptable. All buildings in the project have been constructed to Energy Star standards. Financing for the $20 million project was provided through a creative combination of low-income housing tax credits, subsidies from the New Jersey Housing and Mortgage Finance Agency and deferred development fees. The opening of the Bailey Corner community has had a doubly positive outcome. Both towns have satisfied their affordable-housing obligations, and have shown that the result when jurisdictions work together can be greater than the sum of their individual efforts. Read the Bailey Corner Recommendation by Senator Stephen Sweeney, Assemblyman John Burzichelli and Assemblywoman Celeste Riley.